In great demand as a recitalist, collaborative chamber musician, and clinician, Altus Flutes Performing Artist, Dr. Rik Noyce, is known for his rich tone, exceptionally expressive musicality, and chamber collaborations with vocalists. An advocate of contemporary composition, he has commissioned and premiered numerous new works featuring flute, alto flute, and piccolo. He has held principal positions with numerous orchestras and wind ensembles, and has performed throughout the United States, Canada, Central America, and Europe. Noyce is co-founder of Whole Musician, a collaboration of four uniquely experienced flutists who offer unparalleled intensive university residencies and workshops addressing the mental, physical, and musical demands placed on the 21st century performer. See the Whole Musician tab above or the Whole Musician site for more information. Born and raised in Boston, Massachusetts, Rik Noyce began musical studies at the New England Conservatory Extension Division and later earned his Bachelor of Music degree in Performance from the Hartt School of Music at the University of Hartford. After spending time performing in the New England area and New York, a full talent scholarship brought him to southern California. Noyce holds a Doctorate of Musical Arts, from the University of Nevada, Las Vegas School of Music, and a Master of Music with highest distinction from California State University, Northridge. He has also served as instructional faculty at both universities. Currently, Noyce is Senior Lecturer in Music at Loyola Marymount University as well as Lecturer in Music and Supervisor of Winds & Brass at California State University, Dominguez Hills. 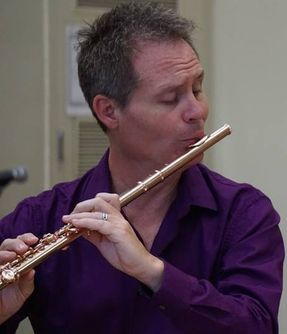 Additionally, he serves on the Oral History and Archives Committee for the National Flute Association, as well as the Advisory Board for the Los Angeles Flute Guild. Along with his many musical accomplishments, Dr. Noyce has been coaching people's lives for nearly twenty years and is a certified Life Coach by the International Coach Federation. Specializing in working with performing artists, he has coached several hundreds of people from all walks of life with time management, productivity, creative blocks, stage fright, and performance anxiety. Thanks to modern technology, he is able to work with people around the world via video chat and phone.